Thermoreactors® infrared emission spectrum lies between a range of 2 to 10 µm and completely and perfectly covers the absorption spectrum of organic coating. 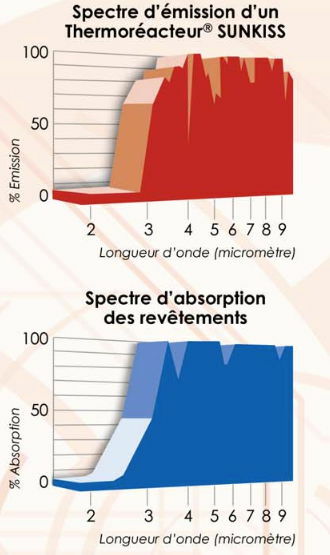 This agreement of spectra results in excellent energy transfer and faster processes of evaporation, drying, fusion and polymerisation. 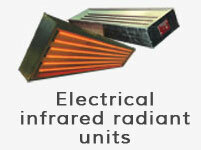 This complements the effect of radiant energy. 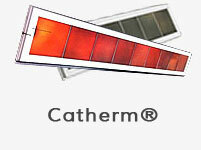 It is generated and controlled by ventilation at the surface of the Thermoreactors®. When deployed in tunnel design, this convectional energy may, if necessary, be enhanced by general recycling of ambient air at controlled speed and temperatures. 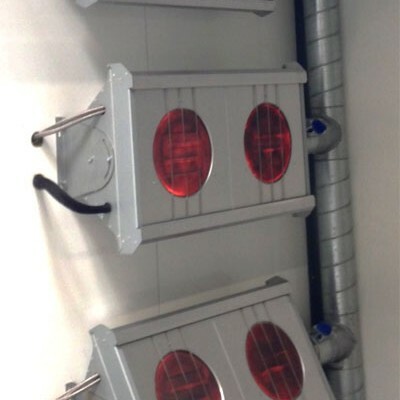 In every Thermoreactors® there is an option to recycle the tunnel’s ambient air to increase the rate at which pollution caused by organic solvents is removed through flameless oxidation upon contact with Thermoreactors®. The power of Thermoreactors® can be adjusted by varying the gas pressure in keeping with appropriate guidelines, such as direct IR reading of the temperature by a pyrometer, power percentage, resulting sensor, setting by part type. The total safety of the Thermoreactors® around organic solvents (VOCs) was established through tests in an explosive chamber (test performed in CEPrR state laboratory). 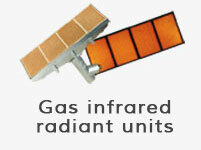 Thanks to its combustion quality, Thermoreactors® does generates neither carbon monoxide (CO) nor nitrogen oxide. Drying time up to 4 times faster thanks to the speed at which the temperature rises and the acceleration of the processes of evaporation, fusion and polymerisation. This still results in a more compact tunnel that makes it ideal for fitting into small areas. A better finish and improved paint lining grip thanks to the core drying, the evaporation of solvents and water from inside to out and the very fast fusion of powder paints. This stage is reached very quickly thanks to the faster drying. 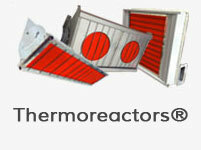 Solvents (VOCs) that come into contact with the Thermoreactors® during drying are destroyed by oxidation without flames. Energy consumption can be cut by more than 50% thanks to the direct transfer of energy from the Thermoreactors® to organic coating. Faster, with less work in-progress. It takes less than 10 minutes to commission a tunnel fitted with Thermoreactors®.